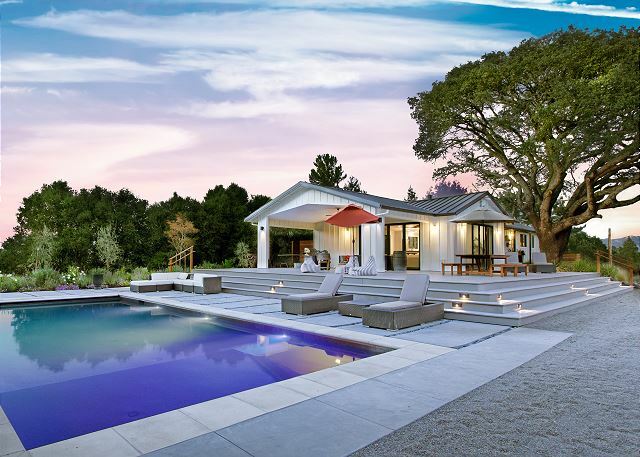 This stunning gated modern ranch house is nestled on one acre among the vineyards, and very well located at the north end of Healdsburg on Alexander Valley Road. Just remodeled, professionally decorated and furnished, this single story, 2000 sq. ft., 3 bedroom, 2.5 bath home sits under the shade of an impressive California Oak. This lovely home features abundant new decking with a large outdoor table for 10 and a beautiful new in-ground pool, 8-person Hot Springs spa and outdoor shower. Enjoy the attractive and comfortable outdoor furniture, bocce and basketball courts. A large covered outdoor entertainment area with grill and plenty of seating provides a wonderful entertaining space overlooking the pool and combines perfectly with the spacious entertainment room, especially when the two window walls are open, inviting the outside in! The hardwood-floored great room and professional-grade gourmet kitchen with Thermador 6 burner gas range, convection oven, natural stone countertops and large island with six stools for the backseat chefs. Adjacent to the kitchen is the dining area with a beautiful wood and metal dining table seating up to 8. 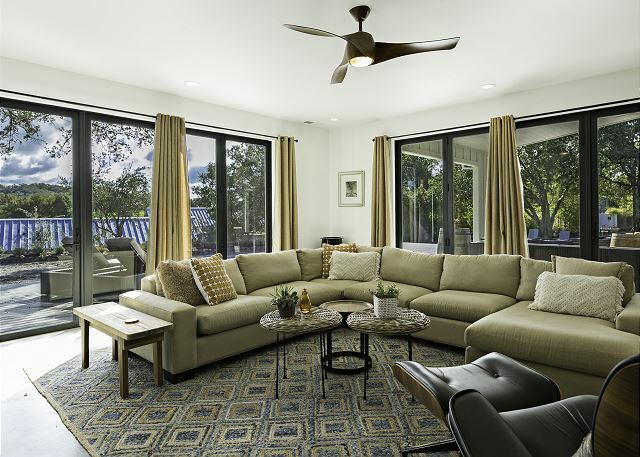 The great room also includes the family room with a large sleeper sofa, enabling up to 8 overnight guests. A slate rock wall with a two-sided gas fireplace separates this area from the media /entertainment multi-purpose room with two window walls which open to the back covered porch. Amenities here include a large 70-inch flat screen Vizio TV with Soundbar, a large area rug and a large sectional sofa. Off the living room is a dry bar with a wine fridge, convenient half bath and stacked Samsung washer/dryer set. To the right of the main entry and down the hallway are a queen bedroom with double closet, shared bath, king bedroom and master suite. 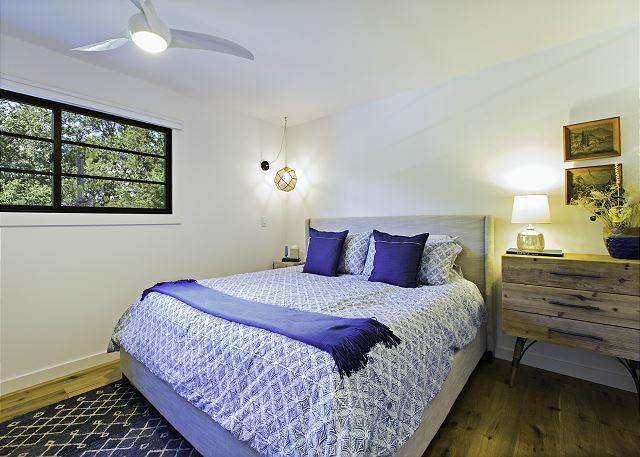 The master bedroom has double mirror doored closets, a beautiful ceiling fan, queen platform bed, large window, and hardwood flooring with rugs. The Master's ensuite bath has a free-standing shower and single-sinked vanity. COME AND ENJOY RENDEZVOUS UNDER THE OAKS FOR A MEMORABLE ENCHANTING RETREAT IN ALEXANDER VALLEY, ONLY MINUTES FROM DOWNTOWN HEALDSBURG! Had a great time in a wonderful house. We are so happy you enjoyed your stay and hope you will come out and stay again! We loved our stay so much that we went back 2 months later. The house is cozy and equipped with everything you need for a relaxing wine county weekend. We cancelled our reservations both nights and stayed home to grill dinner by the pool. We will be back. We stayed in this house for 3 nights. The house is beautiful and in a great location-only a few minutes to town. The outdoor space is especially nice--beautiful pool, comfortable lounge areas, and a nice outdoor dining table. The kitchen is very nice but could be a little better stocked with basic cookware. The bedrooms are nice but not very big, which normally would not be an issue but we had two babies with us so noise did tend to carry. It was a lovely weekend but my one piece of feedback is that while the staff seemed well-meaning, they seemed disorganized. We never received a packet in the mail with check in instructions as they indicated we would. When I did receive them via email after calling twice, it had the address and gate code but no door code (door opens via code not key). The staff member I talked to initially said it was not an 'in-person' check in but then when we called the day we were supposed to check in they said someone would in fact be there. The woman I spoke with said the check in person was supposed to have called us but never did. She also said she did not know the 24 hour emergency number off the top of her head but would call with it, and never did. When we checked into the property, the wifi password in the booklet was incorrect so we had to call to get that sorted out. Finally when I called to let them know we were checking out, the person with whom I spoke did not know what the process was for getting our security deposit back (we did get it back via a check in the mail). So, the staff was nice but it seems like there were some miscommunications and disorganization. Overall, I would consider renting from this company again as our stay was overall very enjoyable, but I think it is important for them to know that there are some gaps with customer service.